Below you will find a selection of large party houses to rent with hot tubs. Have the house all to yourselves – jacuzzi included! Hot tubs are popular with many groups, from the young to the old, and provide a great way to relax at the end of a long day. They’re great for enjoying with a cup of a tea or a glass of Champagne, whilst putting the world to rights. 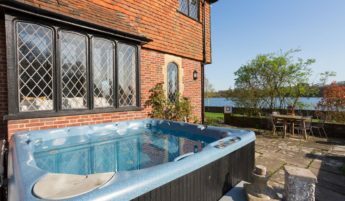 Why not enjoy the views over Bewl Water from the hot tub at Waterside Manor, or dip into the outdoor pool followed by the hot tub at Great Oak Park? For those looking for swimming pools too, please see our pages for outdoor pools and indoor pools.